North Korea is once again the big, bad, boogey man of Asia, a convenient villain Washington will use to fuel a spanking new arms race. If all-out war does not follow Donald Trump’s insane policies aimed at Pyongyang, something miraculous will have to take place soon. The American hegemony turns once again to the Far East, in a redux of the 2000 North Korean sanctions negotiations. I’ll wager that very few people reading this remember the 1999 missile tests over Japan that North Korea used to “negotiate” sanctions reductions. Yes, it’s true and not “fake news”, as the New York Times reported from 2000, “South Korea Plans to Begin Rocket Program”. What, you expected ingenuity and creativity from the Trump administration and the US Congress? Not a chance of that, I say. The elites that run the globalist narrative never divert from what works, I tell you. If young and old Americans were fearful Japan would go up in a mushroom cloud in 1999, then the new generation of willing idiots are all the more capable of apathetic abandon. Trump and Co. are just doing Korea or Vietnam II, since those ventures proved financially profitable for the military industrialists and the economy overall. Do you feel like you’ve been duped yet? Okay, read on. Spooky and scary, huh? The man who lied about WOMD’s and the man who won a Nobel Prize for killing more Muslims than the Crusaders were on top of the intel, and able to pounce like angry lions for the military industrialists and energy moguls! This ultra-secret rocket fuel invented by (Spectre?) the Nazis during WWII to fuel the experimental Messerschmitt Me 163 Komet fighter, is currently used in almost all “storable” rockets used for either military (siloed ICBMs etc.) or civilian rocketry (SpaceX etc.). So, I’ll leave the reader to his or her own devices to figure out why highly venerated New York Times authors would just mislead their readership. The couple citing WikiLeaks to help venerate the story via none other than Hillary Clinton’s US State Department, pretty much takes the cake where unmitigated audacity is concerned. Oh, and by the way. The 1999 rocket shots from North Korea flew over Japan too, just in case you wondered. This leads us to the motive for the Trump administration loosing the collective mind over Iran and North Korea. Some will be surprised to learn Ronald Reagan’s “Star Wars” initiative is ready to be rolled out! Yeah, the real Big Bad Wolf westerners are being warned of is a familiar one, the horrendous fiends Americans must be protected from at all costs (really all costs), ballistic first strike terrorists. And the plan to thwart North Korea or fundamentalist Iran? For lack of a better term, let’s call this version “Skynet”. Yes, the growth perspective of General Dynamics, Boeing, Raytheon, and a score of other corporations will boom if space and the anti-ballistic missile idea catches hold. Some reading are too young to recall the Strategic Defense Initiative (SDI) that the Reagan administration said would end the so-called mutually assured destruction (MAD) strategy of nuclear deterrence. One particular facet of SDI and Star Wars that bears keen scrutiny here is the ABM, or anti-ballistic missile component. Fast forward to June of 2017, and to Russian President Vladimir Putin’s interviews with the famous filmmaker, Oliver Stone. In one segment the award winning filmmaker and Russia’s leader discuss when George Bush abrogated the ABM Treaty with Russia, back in 2001. This “dangerous” moment in US-Russia relations has now ended up threatening to destroy any semblance of nuclear parity, as Aegis ABM systems have now been installed in Romania and Poland, on the frontiers of Russia. And now the Americans are clearly intent on installing the same systems in either South Korea or Japan, which helps completely encircle Russia, thereby creating an even more dangerous situation. This report from The Nation features the Putin interview and the danger of the new SDI, from the Russian perspective, which is equally as important as the western view. There is not space enough to outline how America’s missile defense strategies have metamorphosed in the last three decades under Ronald Reagan’s successors. However, validation of my thesis here can be gleaned by watching the movements of the key people that would be involved in any renewed SDI or Star Wars initiative. So, the fact the new Commander of the U.S. Air Force Space Command’s Space and Missile Systems, Lt. Gen. Samuel Greaves testified the other day before the U.S. Senate, “modernizing” America’s ABM capability was the subject. Greaves, who inherited Reagan’s SDI, Bill Clinton’s Ballistic Missile Defense Organization, and President George W. Bush’s Missile Defense Agency, has more experience and knows more about space based systems than anybody in the U.S. Military. There’s little doubt but that he is a key figure in testing of systems such as the touted Kinetic Energy Interceptor (KEI), offshoots of the Boeing YAL-1 Airborne Laser (ABL), Raytheon’s Network Centric Airborne Defense Element (NCADE), and an array of other top-secret weapons that operate within certain spheres. Instances of programs that focus on the ascent phase intercept (API). Mid-course and terminal phases of ICBM flight are as broad as anyone can imagine. The mid-course system Mr. Putin discussed, the Aegis Ballistic Missile Defense System (Aegis BMD), is but a single facet to extraordinary developmental efforts in the field. Finally, all this “development” spells jobs and money at the endpoint. But there has to be a threat in order to expand research, development, manufacturing, and deployment of these systems. Once again, North Korea plays a vital role in drumming up enough good old fashioned fear to justify trillions of dollars in weapons programs. Therefore, the lie has to be manufactured and propagated through trusted media like the New York Times and other corporate or elitist controlled channels. Advertising was never so effective as when it’s applied to products that save lives and liberty. 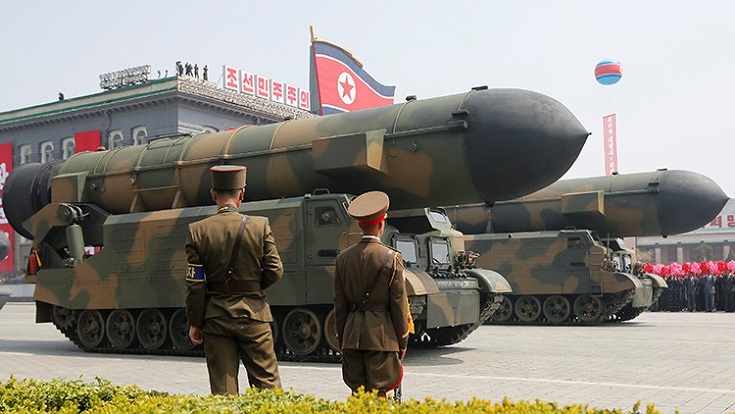 Stay tuned for North Korea to announce a cessation of all testing in exchange for lifted sanctions, and for Raytheon and others to announce new contracts for advanced deterrent systems.